Flowering Season: Spring, Summer, Fall. The main bloom period is in the springtime. 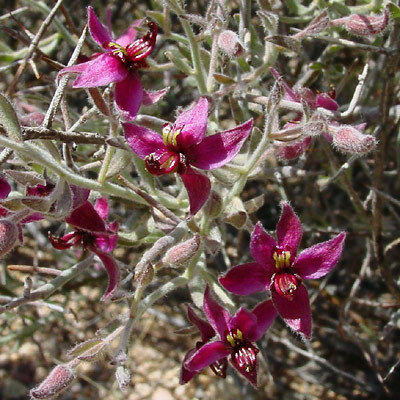 Description: The flowers are 1/2 inch (1.3 cm) across and have 5 tiny petals and 5 reflexed, petal-like, point-tipped, magenta sepals. 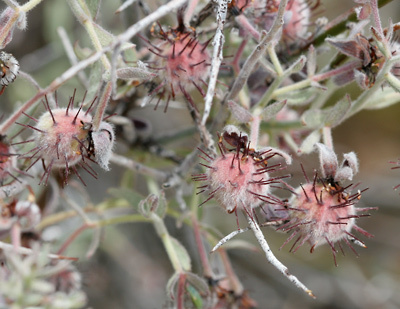 The nutlike fruits are ball-shaped and covered in fuzzy, usually pinkish hair and red-brown spines with barbed tips. The sparse, inconspicuous leaves are small, simple, narrow, alternate, grayish green, and covered in white hair. The numerous stems are slender, well-branched, and densely covered in fuzzy, white hair, giving the plants a smoky white appearance. The plants are partial root parasites of nearby plants. 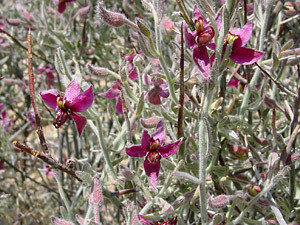 The similar Littleleaf Ratany (Krameria erecta) can be found in upland areas and has flowers with a cupped bottom sepal, while Trailing Krameria (Krameria lanceolata) has long, trailing stems and conspicuous, green leaves.